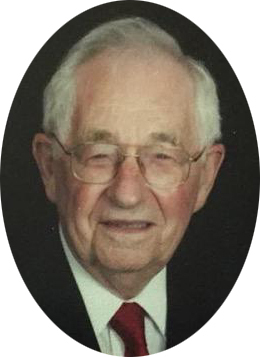 After a lifetime of service, Vernon A. Rohr, 94, of Canal Fulton, Ohio, went home to the Lord on November 22, 2018. He was born in Canal Fulton on May 16, 1924, to the late James and Marguerite Rohr. Vern attended SS Philip & James School and graduated from Canal Fulton High School in 1942. Vern ran the family farm for many years before he bought a NAPA franchise in North Canton, Ohio. The franchise was first known as Workman’s Auto Parts until Vern bought out his partner and changed the name to Vern’s Auto Parts. Vern was also employed by Fulton Mower Sales and then Graphic Enterprises. Vern was a farmer by birth and a self-taught engineer by trade, known for rendering mechanical drawings for future projects on the nearest napkin. Vern dedicated his life to his family and his church, serving as Eucharistic Minister, Minister of the Word, and Instructor of Religious Studies for countless years. Vern also visited and brought Holy Communion to the sick and homebound. Vern married the love is his life, Margaret A. (Graham) Rohr, on October 17, 1946. They raised eight children together. He is survived by his children: John (Nancy) Rohr, Margaret R. (Julian) Laboucane, Timothy (Pamela) Rohr, Richard Rohr, Christine (Thomas) Cooney, Maureen (Mat) Pepe, and Brian (Dana) Rohr. He is also survived by 12 grandchildren and 17 great grandchildren; brothers James (Ann) Rohr, Robert (the late Marge) Rohr, two sisters, Sister Ruth Rohr, O.S.B., Dorothy (the late Glenn) Konen, and brother-in law Jerry Staley and sister-in-law Ann Graham. In addition to his wife, Vern was preceded in death by son Terrence Rohr; daughter Kathleen; brother Thomas (the late Patricia) Rohr; Sister Julia Rohr, O.S.B., and Sister Marietta Rohr, C.S.A. Mass of Christian Burial will be celebrated Monday, November 26th at 10:00 am, at SS Philip & James Catholic Church, 412 N. High St., Canal Fulton, Fr. Kevin McCaffrey celebrant. Burial will be in SS Philip & James Cemetery. Friends and family may call Sunday, November 25th from 3pm to 7pm AT THE CHURCH with Rosary at 2:30pm. The family would like to thank Kathleen, Dawn, Darren, Chrissy, Rachel, Lori and Doug of Mercy Hospice for their kind and compassionate care. In lieu of flowers, donations may be made to SS Philip & James School, 532 High St NE, Canal Fulton, OH 44614 or Mercy Hospice, 4369 Whipple Ave NW, Canton, OH 44718.